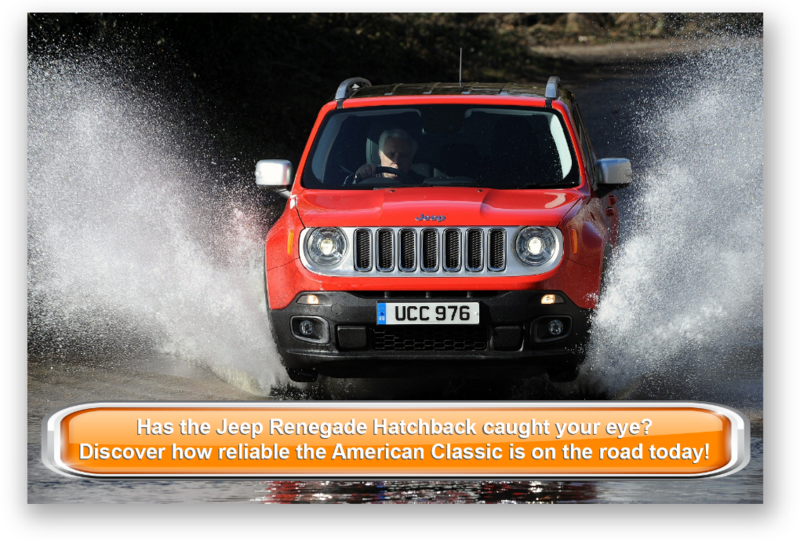 Looking for an objective review of the new Jeep Renegade Hatchback? OSV has got you covered, from engines to lease deals. As ever, the new Jeep Renegade Hatchback stands out from its competitors, thanks to its unique, chunky styling that gives it plenty of friendly aesthetic appeal. It’s the kind of loveable off-roader you could hug. Jeep is now owned by Fiat, and the Renegade takes a few of its design cues from the Panda, which explains the cuteness. Off-road performance is strong, but thanks to a good amount of engines to choose from, the new car is also a stellar companion on the road, too. Visibility is good thanks to the high seating position, and there is plenty of space on offer for you, your passengers and your luggage. Ready for some rough and tumble? OSV takes a closer look at what the car is all about with our 2017 Jeep Renegade Hatchback review. The new Renegade is better off the road than it is on it, but that isn’t to say it’s not capable on tarmac. It’s just that there are better all-rounders in this sector. However, if you’re looking for an excellent off-roader, this brawny Jeep has your back. It also makes for a good tower. As far as compact SUV’s go, the MINI Countryman is probably the most entertaining to drive. However, the Renegade is a bit more feedback and directness away from being a very accomplished and very fun going car indeed. It also offers lots of grip, which inspires confidence in slippery conditions. The car certainly has its weaknesses on the road, but off it they are turned into strengths. The damped steering prevents harsher terrain from knocking you out of your stride, while the slow action enables you to time your low-speed twists and turns to perfection. With a bit of foresight on your part, the Renegade is ideal for when the going gets tough. The best model in the range is the TrailHawk, which is powered by a very competent 2.0-litre diesel engine that has plenty of shove. This unit is paired up to a 9-speed automatic transmission, which is super responsive and ideal for trickier situations. It can get you from a standstill to 62mph in 8.9 seconds, and is a faster and smoother option than the 1.6-litre diesel engine. A pair of petrol engines completes the range, starting with a 1.4-litre 168bhp model that is the quickest of all the Renegade’s engines. It can do 0-62 in just 8.8 seconds, and actually feels even quicker. However, it’s fairly expensive to run. A 1.6-litre petrol engine is more sluggish, and takes 11.8 seconds to get you from rest to 62mph. It’s also the least efficient power plant to choose from. The interior is hit and miss, especially in terms of quality, but also in terms of practicality. 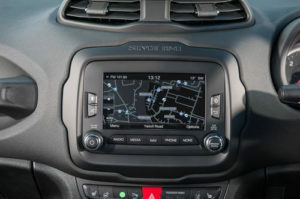 There are top quality soft touch plastics here and there – especially on the dash – but Jeep have been unsparing with their use of harder, lower quality materials, too. The steering wheel is shared with the Fiat Panda, as are other cute details. However, these seem at odds with a robust off-roader. The sat nav isn’t all that clear, but integration of route directions is fantastic, and will help you plot your journeys into more remote, off-road regions. The wide opening doors and boxy shape of the car ensure that it’s reasonably practical. And despite its compact dimensions, there is a surprisingly good amount of space available. However, there are a few criticisms. Although a raised ride height means there should – in theory at least – be good visibility, this is offset by thick window pillars. Moreover, head rests on the front seats have a tendency to dig into your shoulders, which over time becomes a nuisance. Worse still, this is not an easy car to park, despite it small stature. Road noise is a bit of an issue, thanks to the square shape. 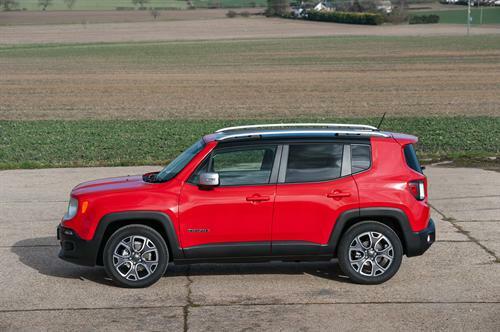 However, this is something that affects many cars in this class, and the Renegade is actually among the most refined. But whichever model you go for, there will be noise. The boot measures 351-litres, which is not unreasonable. You can increase the size to 1,297-litres by folding down the rear seats. A neat feature is a front seat that folds forward, allowing you to load in longer items. The opening is big, but the lip is a bit awkward. Three-way split-folding rear seats are not available on the cheaper models. If you want to use the Renegade as a towing vehicle, it can tow weight of up to 1,500kg. Our favourite model is the Limited model, which gets automatic light and wipers, a 6.5” touchscreen and parking sensors as part of its standard kit. The Sport trim chucks in alloys, a 5” touchscreen display and air conditioning, while the tougher range-topping TrailHawk model benefits from rubber flooring, a better four-wheel-drive system, and extra right height. The TrailHawk also benefits from better rear and front bumpers and chunkier tyres, which make it the ideal choice if you’re planning on spending most of your time on rougher terrain. The list of optional extras includes over 100 items, among which are on-boar WiFi and parking sensors. Prices for the new car start out from £17,500 and rise to £29,000. If you prefer to lease, you can pick up a deal from as little as . The 2017 Renegade is a star at the pumps. Despite being such a competent off-roader, it’s economical. However, it’s all relative. Because, while this car is undoubtedly cheap to run as an off-roader, there are cheaper road-based rivals. The most frugal engine in the range is the 1.6-litre MultiJet diesel engine. It’s good for returns of 64.2mpg and costs £30 a year in road tax if you stick to two-wheel-drive and pair it up with the manual transmission. The 1.4-litre petrol engine, meanwhile, can achieve returns of 47mpg and costs £110 a year to tax. The 2.0-litre diesel is more powerful but is still reasonably economical. It can return 55.4mpg in 138bhp guise and 47.9mpg in 168bhp guise. The most you’ll have to pay in tax is £185 a year. When it comes time to insure, the most basic Renegade sits in insurance group 8, while the most expensive occupies group 15. You’re either going to love or hate the way this car looks. It’s chunky, it’s boxy and evokes memories of the old Wrangler models. This one is cuter, however. This is an excellent off-roader that packs more than a punch. It’s got brawn, steel and mettle and won’t go hiding when you need it most. It’s spacious and practical, and can sit five adults. Being great off-road might not mean much to you if it can’t handle itself all that well on it. It’s not awful, but it’s not much fun on the tarmac. See above. You’re either going to love or hate the way this car looks. 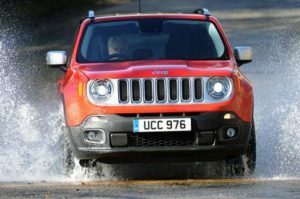 Let’s see how the car fares against its chief rivals in the comparison section of our 2017 Jeep Renegade Hatchback review. 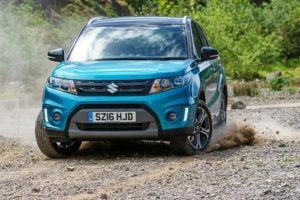 The new Suzuki Vitara is cheaper to run than last time around, and can also boast a much better kit. It’s also retained its sense of fun. There aren’t many engines to choose from, but the ones that are here feel sporty and more than adequate. There is a choice of gearboxes, but we think that the 5-speed manual transmission suits this car’s nature the best. It’s economical, and is nice and responsive. The Vitara is available with four-wheel-drive that also you to tweak its transmission settings to suit your driving style, or the conditions. However, the four-wheel-drive system it not the best, and may feel largely redundant to some of you. The engine range begins with a 1.6-litre petrol unit that does without turbochargers. It delivers up to 118bhp, which means it hasn’t got the lungs to keep going as much as you’d prefer. A turbocharged 1.4-litre petrol engine has more puff and delivers up to 138bhp, with all its power distributed evenly around the revs. It can do 0-62 in 10.2 seconds. A 1.6-litre turbocharged diesel engine rounds off the range nicely. It can do 0-62 in 11.5 seconds, but actually feels faster. It produces most of its power low down the rev range, and doesn’t need you to whip it to get the most out of it. The cheapest engine to run is, unsurprisingly, the diesel. It’s capable of achieving fuel economy returns of 70mpg, but it’s worth noting that this is when you opt for two-wheel-drive and pair it up with the manual transmission. Moreover, 70mpg is the official figure, and the likelihood is that you’ll be looking at average returns around the 60mpg mark. The 1.4-litre petrol engine, meanwhile, is good for 52.3mpg and costs £110 a year in road tax. Inside, the new Vitara doesn’t stand out from the crowd, but it does have a few useful and even smart touches. It’s comfortable enough to sit in and drive around in, but the diesel model is more comfortable than the petrols, where the ride quality is compromised. The build quality of the cabin is mostly good. A few hard plastics threaten to let things down, especially on the top-spec models, where you expect more quality. The Suzuki is a useful family car. Its well-designed boot measures 375-litres, and this space can be extended to 1,160 by folding down the rear seats. That makes it bigger than the Jeep’s, as well as a host of other rivals in this sector. Headroom is good throughout, but rear legroom is decent at best. Taller adults might struggle. The new, offbeat Nissan Juke SUV stands out from the crowd as much as the Jeep does, thanks to its unique styling that has stood the test of time. 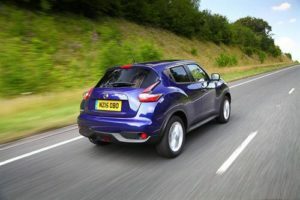 The Juke can offer a select number of punchy engines, but it’s not much fun to drive. And despite Nissan setting up its suspension in such a way that it offers comfort, you’ll really feel a shudder or two if you crash over a big enough pothole. Handling is decent, and body control is well kept under wraps. A 1.6-litre petrol engine sits at the bottom of the engine range. It develops up to 93bhp when paired up with a manual transmission and 113bhp when paired with an automatic CVT. It can do 0-62 in 11.5 seconds, but doesn’t feel especially quick. Our favourite petrol engine is a DIG-T 1.2-litre unit that comes with a turbo. It’s cheaper to run than the 1.6-litre alternative, and has more powerful. It also suits the Juke’s quirky character more. There is only one diesel engine in the range, which is a 1.5-litre dCi unit that can get you from rest to 62mph in 11.2 seconds. Thanks to the addition of turbochargers, it’s nippy and also cheap enough to run. Average fuel economy returns of 70mpg are not to be sniffed at, and they also make it cheaper than anything the Jeep can offer. By class-standards, the petrol engines are cheap enough to run. The 1.6-litre petrol sees returns of 47mpg at best, but the 1.2-litre benefits from turbochargers to average 50mpg. The funky-looking cabin will grab your attention on the showroom floor, but once inside you’ll find that it’s all a very glossy facade. Material quality is not great, comfort is lacking, and the steering wheel can only adjust up and down. Still, the colours are vibrant and nice to look at. Practicality is not the Juke’s strong suit, although its 354-litre boot is over 100-litres bigger than last time. This is an impressive achievement, and it’s one that was needed. However, you will only see this improvement if you opt for a two-wheel-drive model. Go for a four-wheel-drive Juke and you’ll get just 251-litres of boot space. 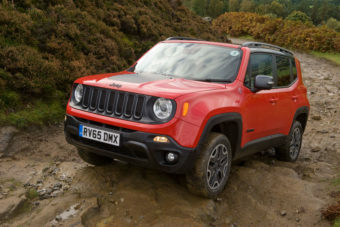 If it’s genuine off-road ability you want from a car that doesn’t look like something even a mother couldn’t love, this Renegade is worth a test drive. Although its boxy shape won’t be to everyone’s tastes, there is no denying that this is a muscular car that comes with more than a hint of cuteness. It’s unflappable off the road, but not the most commanding on it. However, it’s competent enough and dripping with character. It’s also practical and super cheap to run. At its price point, the new Jeep Renegade Hatchback is going to be a hit.